Lee's not as young as he used to be (he did turn 40 this past year), so was on the lookout for places to rest and relax on this trip. 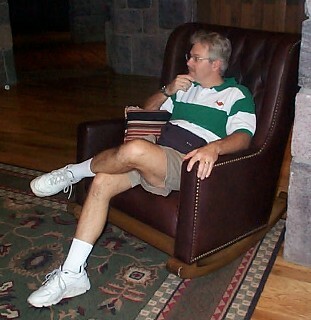 It turns out that there are lots of rocking chairs around Disney World (no doubt intended for the older folks like Lee), and he tried some of them. We didn't make an exhaustive rocker search (because that would have been, well, *exhausting* :-) ), but here's some examples of them. 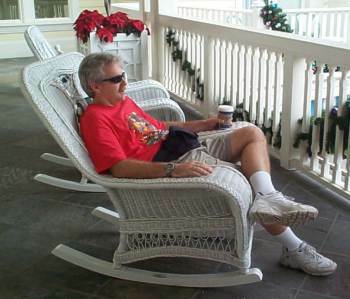 If you have your own favorite rocker that we missed, drop us a line at lgil@cts.com, and we'll try to have Lee check it out on our next trip in March! 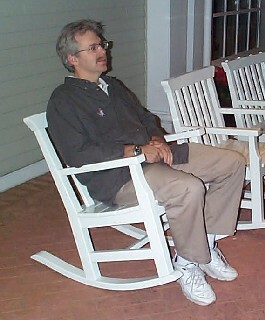 Lee rocks out on the porch of the Beach Club, looking out towards Crescent Lake. 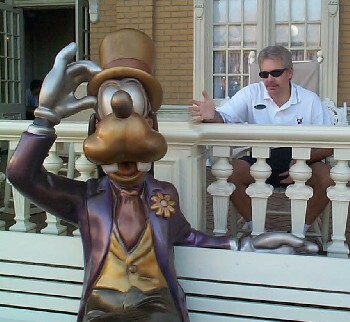 In a rocker outside the Magic Kingdom's Exposition Center, Lee tries to get his point across to Goofy. 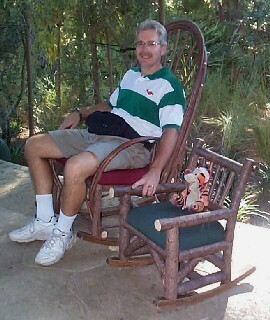 Outside the Villas was a whole family of rustic "branch" rockers - so Tigger joined Lee. Text and photographs copyright © 2000, 2001, by Laura Gilbreath. Feel free to link to this document, but you may not redistribute it in any form without the express written consent of the copyright holder.